Written by Will on July 13, 2012 and posted in Papercraft. The Minecraft 1.7.3 update has gone live today. In celebration I decided to share some pictures of the Minecraft papercraft models that my girlfriend made. I promised you that I would share pictures of her Enderdragon papercraft in the last Let’s make Papercraft! so let’s get started right away. This is what our Enderdragon looks like from the front. We’ve made tons more than just the Enderdragon. My girlfriend has gone through and made almost every single Mob, Animal and block that is in the game. The plan is to make everything from the game – excluding all the hundreds of items, of course. She’s only got a few more of the enemies to make – the skeleton, blaze and maybe one or two others. Here’s a few of the models on their own. I took about 30 – 40 pictures of her models today. One of each item on its own,differing angles, collections etc. I could have kept going, making different scenes but I stuck with just the one simple scene. A tree in the background with the mobs and animals spread around. I started with just the animals but then kept adding more and more mobs until most of the models were in the picture. We have more models over in the Papercraft Gallery. Things from The Legend of Zelda, Sonic, Halo and Angry Birds but my girlfriend is focusing on completing out Minecraft cutouts collection before she does anything else. I’m working on a Skyrim Dragon too, if your interested. I will be uploading my first progress update later today. All of the Minecraft Papercraft templates we used for the models in these pictures came from http://minecraftpapercraft.com/. This is the little Minecraft scene that I put together featuring a papercraft tree for scenery. 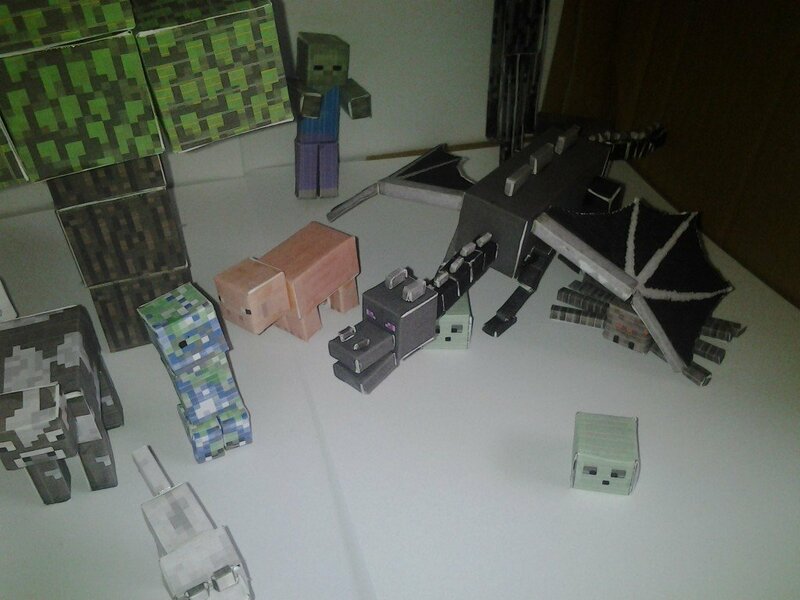 A paper craft Ender Dragon, pig, wolf and other animals a charged creeper, zombie and slime.